The Malaysian activists known as the Parti Sosialis Malaysia (PSM) 6 were released on Friday evening at 5.30pm Kuala Lumpur time, CCI sources say. The release came shortly after Dr Michael Jeyakumar had announced that he was beginning a hunger strike. Ex-YCW Sarasvathy Muthu was among those released. 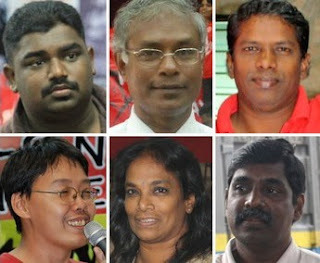 The six PSM members – Choo Chon Kai, Sarat Babu, M Sarasvathy, M Sukumaran, A Letchumanan and Sungai Siput parliamentarian Dr Jeyakumar Devaraj – were initially detained on suspicion of planning to wage war against the King, reports Malaysiakini.